The peloton rides along the Mediterranean during Le Tour Méditerranéen. - This page is dedicated to cycling's Hour Record. 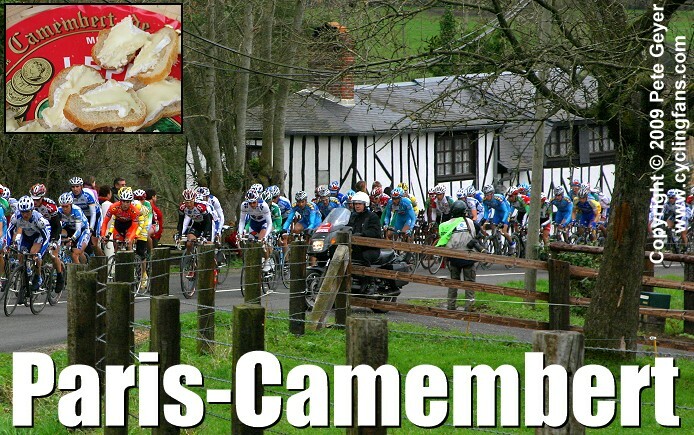 The peloton winds its way through the back roads of Normandy, 2005 Paris-Camembert. Info, links, photos and video below. 2010 Tour de l'Avenir: The peloton crosses the rue Voltaire bridge in Vierzon at the start of Stage 1. 2010 Tour de l'Avenir: Race leader Taylor Phinney and Team USA before Stage 1. 2010 Tour de l'Avenir: Phinney and Alex Dowsett of Great Britain before Stage 1. Dowsett finished second to Phinney in the prologue. 2010 Tour de l'Avenir: Phinney on his way to winning the prologue. - The 2010 Tour de l'Avenir runs from September 5-12. We don't expect there to be any live streaming video. Below are a few pics from Saturday night's teams presentation in Vierzon. More race info and photos to come. 2010 Tour de l'Avenir: Team Spain is presented to the public on the eve of the prologue. 2010 Tour de l'Avenir: If Bernard Hinault was thinking of Laurent Fignon, he wasn't the only one. Master of ceremonies Daniel Mangeas encouraged the crowd to applaud in memory of Fignon. 2010 Tour de l'Avenir: Taylor Phinney and Team USA wait to be introduced to the public. 2010 Tour de l'Avenir: The view from my hotel room in Vierzon. The peloton will cross the bridge at the start of Stage 1.